From The New York Times to Fox Business, a sampling of recent headlines on stories about wages falling below the inflation rate. So Why Are Working People Still Broke? The average American workers’ paycheck has a few more dollars in it than it did a year ago, but it doesn’t stretch as far. 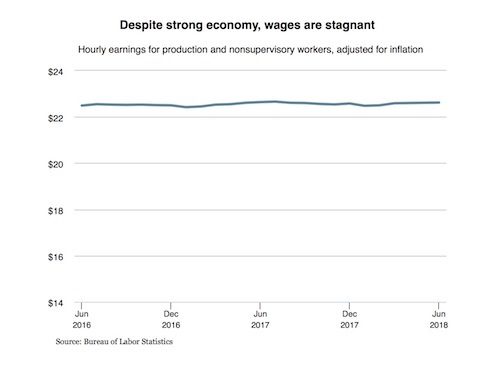 This CBSNews.com chart shows real wages falling below the rate of inflation, which rose 2.9 percent between June 2017 and June 2018. “According to the PayScale Index, which tracks quarterly paychecks, inflation-adjusted wages between April and June shrank nearly 1.5 percent compared with the same period last year,” CBS reports. With a virtually straight line, this Boston Globe chart shows no increase in the real average wage for U.S. non-supervisory workers (excluding farmworkers). 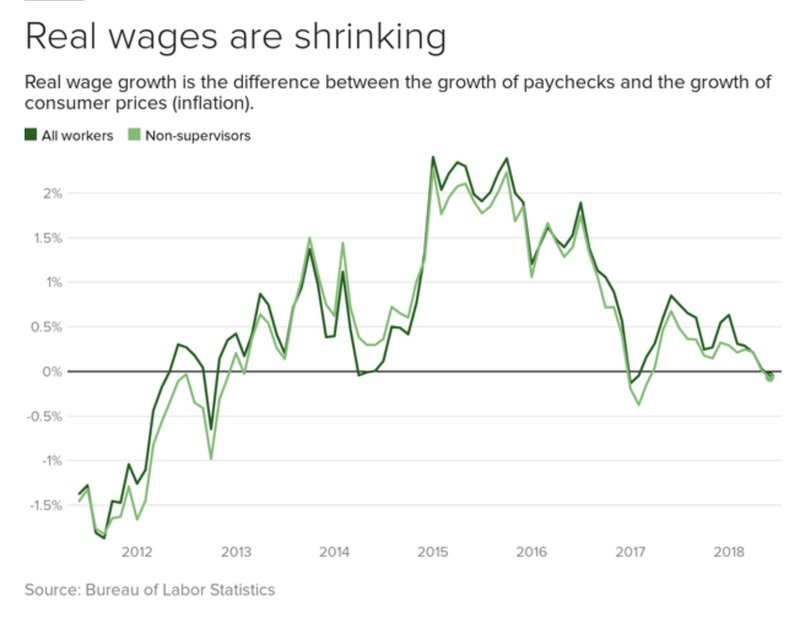 Despite a tight job market and Republican promises about tax cuts trickling down, wages aren’t keeping up with inflation. Drivers who filled their gas tanks for $40 last summer are spending $50 now. The cost of living overall – rent, food, clothing, transportation, medical care and more – is 2.9 percent higher than in June 2017. Yet wages are up just 2.7 percent. That means, adjusted for what each dollar actually buys, real wages are down for non-management workers over the last year. “Jobs may be plentiful and corporate profits strong, but the U.S. economy is still failing workers,” the Boston Globe reported July 15. In what should be a seller’s market for workers, economists are bewildered. Their theories involve globalization, technology and, importantly, the ceaseless attacks on unions and the right of workers to bargain collectively for better pay and benefits. Corporations are violating the laws of supply and demand with impunity, giving them little or no incentive to make good on the sales pitch for the 2017 tax cuts. Less than zero, in fact. Her post about Bureau of Labor Statistics data for the second quarter of 2018 showed “usual weekly earnings” – earnings before taxes and other deductions and including overtime – rising 2 percent, or 0.7 percent below the rate of inflation. While workers toil away for less and less, companies are using their tax-cut windfalls to buy back hundreds of billions in stock and further enrich executives and shareholders – namely the top 10 percent of Americans who own 80 percent of all stock. “There’s a bit of a myth that through indirect holdings, like holdings of stock in a pension fund, the stock market has become democratized, and everyone’s all in. Not so,” economist Jared Bernstein said in a column for The Washington Post. Now, corporate profits account for 13.2 percent of national income, and workers’ share has dropped to 62 percent. “Worker productivity has been soaring for 40 years, sending corporate profits into the stratosphere,” International President Lonnie R. Stephenson said. “How is it possible that workers aren’t breaking even, let alone getting ahead?